I recently started a degree in economics via Penn State University, and based on the last years worth of economic data, it appears the birth of a new U.S. recession is heralding my entry into the field. 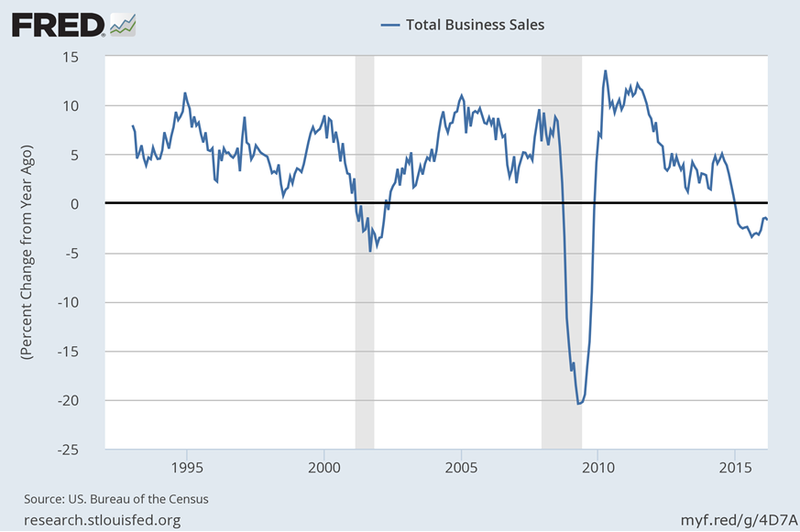 Let's start with the year-over-year percent change in total business sales (Fig. 1). The recession of 2008-09 is quite prominent, with total business sales falling 20%. 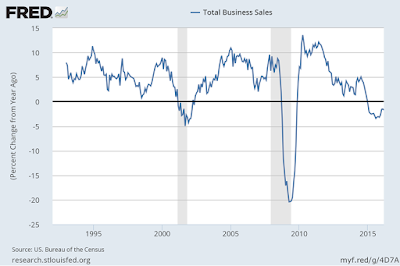 Business sales rebounded after the recession, as expected, with peak growth just under 15% occurring during April of 2010. Since that point, the percent change increase in sales has gradually fallen, eventually turning negative during early 2015. Unsurprisingly, the last two recessions have been associated with a negative year-over-year percent change in total business sales. Why would the current trend be any different? Figure 1. Total Business Sales. Percent change year-over-year. 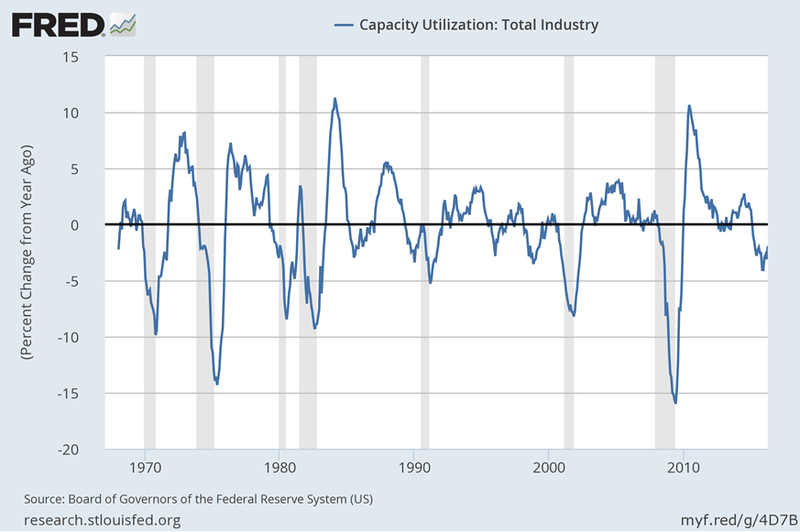 Next, consider the year-over-year change in capacity utilization (Fig. 2). 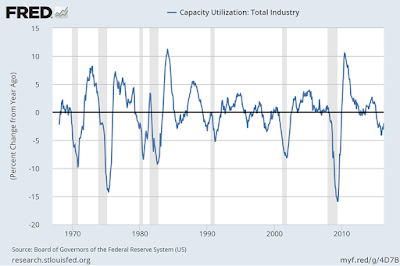 Capacity utilization is a measure of actual output versus potential output. A decrease in capacity utilization indicates falling demand for goods and services, resulting in an increasing gap between actual and potential output. As seen in Fig. 2, capacity utilization has experienced a negative year-over-year change 13 times since the late 1960's, and recession has occurred 7 times during these negative cycles. Furthermore, recession was perfectly correlated with a -5% or lower year-over-year percent change in capacity utilization. The year-over-year percent change recently bottomed out at -4% during December 2015, and has since risen slightly. Figure 2. Capacity Utilization. Percent change year-over-year. 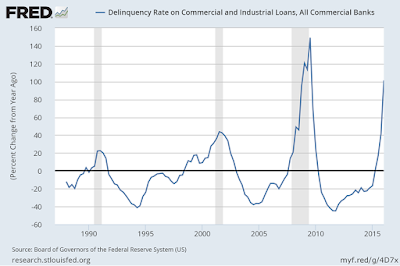 Speaking of perfect correlations, a positive year-over-year increase in the delinquency rate on commercial and industrial loans was associated with recession in 1991, 2001, and 2008. Figure 3 shows that the U.S. is experiencing a dramatic increase in delinquency rates; currently 101% higher as of the first quarter of 2016. Figure 3. 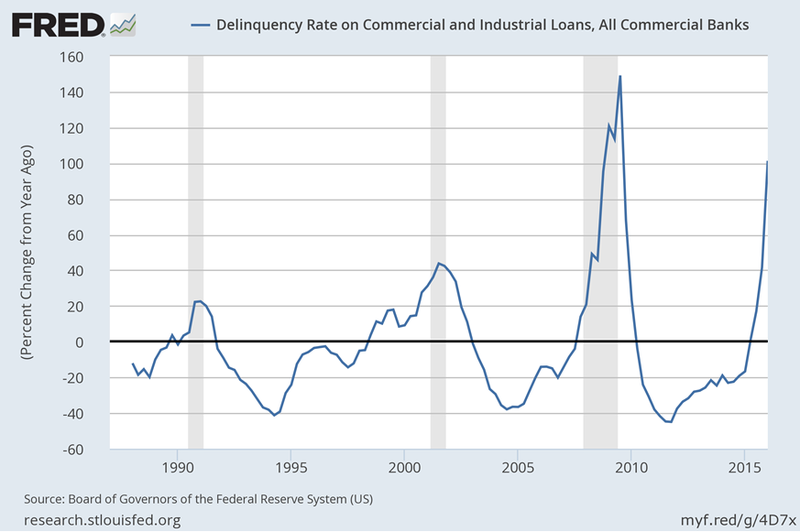 Delinquency Rate on Commercial and Industrial Loans. Percent change year-over-year. Economic investment is the purchase of equipment and new technologies by firms in order to increase future productivity and output. Investment is also one component in the calculation of national GDP (consumption, government spending, and net exports being the additional components). 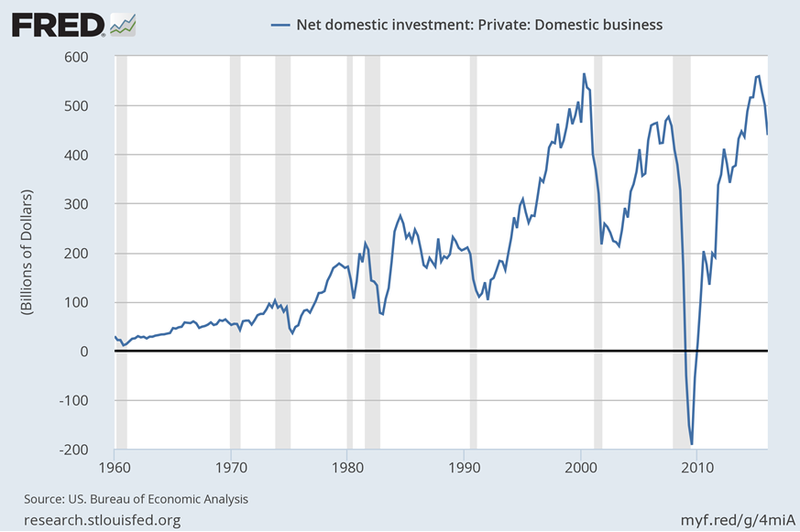 Unfortunately for the U.S., net domestic business investment has recently fallen off a cliff. After the 2008-09 recession, business investment climbed to a peak of 559 billion dollars during the second quarter of 2015. Thereafter, investment has fallen to a first quarter 2016 value of 439 billion dollars, which is a percent change of -21%. Figure 4 shows that large falls in business investment eventually yield recession as subsequent productivity and output decrease. Figure 4. 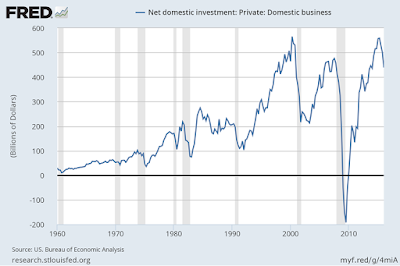 Net Domestic Business Investment. Billions of dollars. As productivity and output fall, firms inevitably hire fewer workers, or layoff employees in order to reduce input costs. 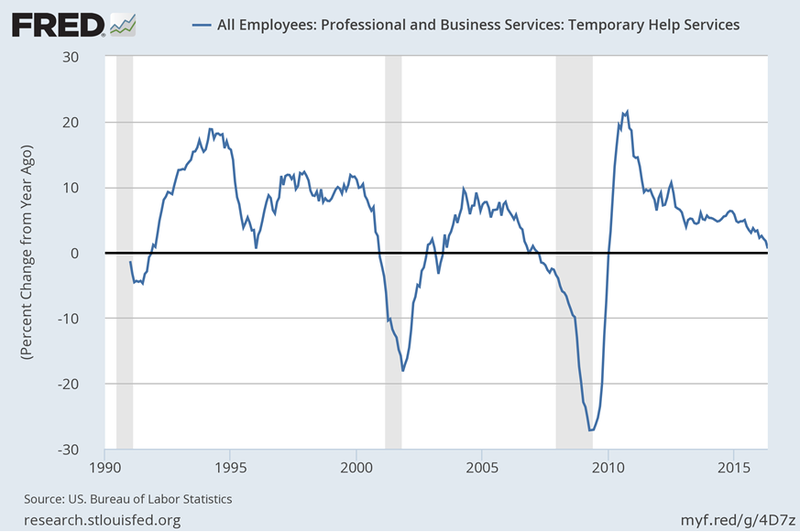 Temporary workers are usually one of the first employment sectors experiencing a reduction, and this is especially true in the massive U.S. service sector. 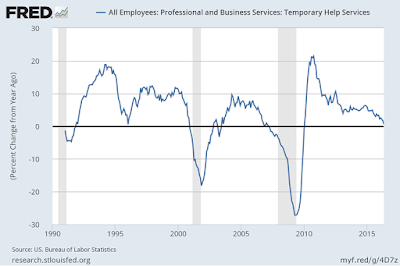 Figure 5 indicates that growth in temporary help in professional and business services has reached its apex, and is now about to go negative. Negative growth in this sector has been followed by recession during the last three decades. Figure 5. Temporary Help in Professional and Business Services. Percent change year-over-year. Based on the trends discussed above, a U.S. recession appears increasingly probable during the next year (based on historical evidence). The May jobs report of 38,000 severely missed the consensus forecast of 160,000, and represents a continued downward trend in hiring. Evidence is mounting that all is not well with the U.S. economy.